Search Engine Optimisation is critical to any organisation be it online or bricks-and-mortar and regardless of whether it's located in Kew, a neighbouring district or any other London Borough. It goes without saying that if you're not visible on Google, Bing and Yahoo! then your company simply can't compete in today's global (digital) economy. The first port of call for any potential buyer looking for any product or service is a search engine query and if your presence is not optimised you'll be missing out on potential future customers. If you're based in any capital city competition for all keywords is fierce, and London is no exception. Promote Agency can help with your organic rankings both nationally and locally - after all you found us through a natural search didn't you! We can do the same for your London-based business too. 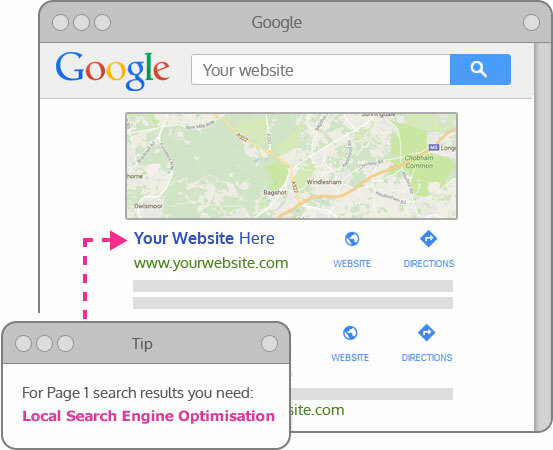 If you want to target your product or service by locality, for example in Kew or further afield such as Richmond upon Thames or even Greater London and beyond Promote will help you focus your online marketing efforts into local SEO with the aim of getting your business ranking in what is affectionately known as the "Map Pack". As users become more savvy with the way they search on Google they understand that the keywords they use to query convey their intent so it is vital to target the correct keyword phrases that buying traffic (assuming you're goal is to convert a browser into a sale) are using because of course rankings mean nothing without conversion. The correct way to go about any SEO starts with undertaking keyword research and not guessing what people may type in. At Promote we use a range of tools including Google's own Keyword Planner Tool to calculate keyword efficiency (KEI) - the number of searches as a percentage of the total amount of competing (or indexed) web pages. We will then optimise your on-page HTML mark-up to ensure it makes sense semantically and clearly describes what it is you do.